E) 100-db… Alarming, demanding and extremely distracting like the crack-crack of nearby rifle fire. In essence, the expected sounds that come from your home air conditioning system should seem mild and distant like echoes along a park walkway. It’s a sound that you hear but easily tune out. When the noise level from your home air conditioning unit seems odd, interruptive to thought or conversation, or simply out of place for current expectations, you should take immediate action. Never ignore the audible signs of possible HVAC system complications. 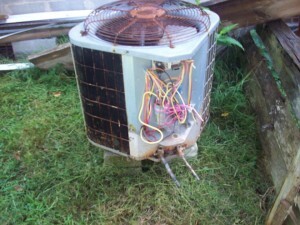 Delayed AC repairs typically ensure an increase cost for said repair. Safety Tip: Never attempt repairs on any A/C unit without first disconnecting power to the system. If you are not comfortable examining your own system, now is the time to contact the nearest Phoenix-regional office of ACH. Gently correct any blades that appear bent. Purchase a fin comb and then cautiously correct any bent fins. Note: Incorrect combing can result in additional damage. Everything machine that vibrates runs the risk of producing loose screws. Air conditioning and heat pump systems are not immune to the problem. System vibrations can affect screws associated with fans, mounting panels and even electrical components. The fix: Use reset the screws. Repairing AC lubrication problems exceed DIY efforts. Too little coolant remains a problem. Too much coolant generates another type of problem. Furthermore: Conscientious HVAC service providers find and fix leaks prior to adding more refrigerant. Some of the above steps are simple. But resolving major Phoenix air conditioning noises often demands the services of a major Phoenix A/C service provider. If the problem persists, contact American Cooling and Heating Today.